Photo: Paul Wellman (file) Cal Fire firefighters from Norco, California work to defend homes near Casitas Pass on the morning of Monday, December 11. Ventura fire investigators have determined that Southern California Edison power lines slapping together in high winds ignited the 2017 Thomas Fire, which burned for more than a month across Ventura and Santa Barbara counties, consuming more than 280,000 acres of terrain and destroying hundreds of family homes. The 71-page report published Wednesday describes the fire’s starting point as Anlauf Canyon near Thomas Aquinas College. Firefighters received the first 9-1-1 call at 6:23 p.m. on December 4, 2017. The report also makes note of a second wildfire that began approximately an hour later at 7:30 p.m. near Koenigstein Road. It was treated as a separate incident and named the Koenigstein Fire. By 1 a.m., however, the two fires had merged and were thereafter referred to as the Thomas Fire. 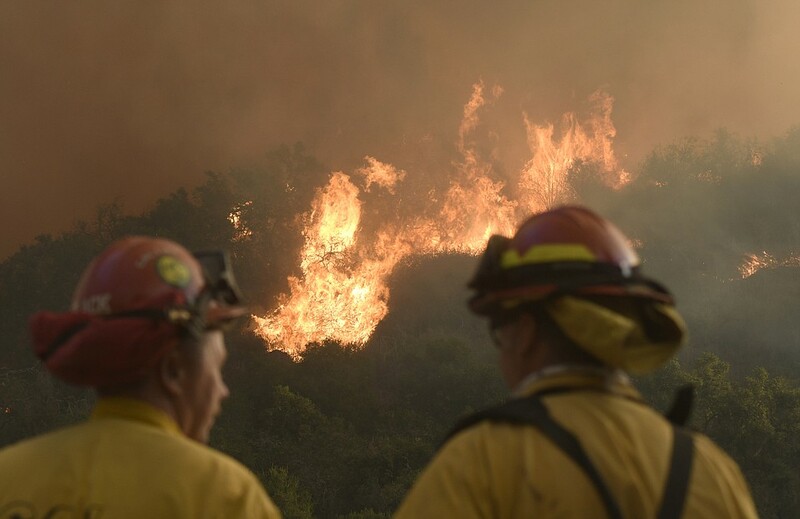 Ventura authorities, who conducted their investigation alongside Cal Fire, the Santa Barbara County Fire Department, and the U.S. Forest Service, have forwarded their latest findings to the state attorney general’s office and recommended that the utility face charges of involuntary manslaughter, negligence, and unlawfully causing a fire causing great bodily injury. The debate will continue in court, where Edison faces more than $1.3 billion in insurance claims filed by Thomas Fire victims. Two people were killed by the blaze ― a Ventura woman evacuating her home and a firefighter on the front lines. The company may also be on the hook for another $400 million in claims filed by 1/9 Debris Flow victims. The Thomas Fire stripped the hillsides above Montecito of all vegetation and gave rise to the late-night cascade of mud and boulders that claimed 23 lives. PG&E, Edison’s counterpart in Northern California, is facing its own bevy of lawsuits that claim the utility’s equipment sparked multiple deadly wildfires. PG&E has threatened to declare bankruptcy should it be held liable. Both companies have since initiated programs that preemptively shut off power during extreme fire weather.